Serena Williams defeated Maria Sharapova, 6-3, 7-6, in the Australian Open final, giving Williams her 19th Grand Slam singles title and 16th straight win over Sharapova in their head-to-head rivalry. Back in 2013, on the eve of the French Open women's singles final (which Williams won, to increase her winning streak at the time to 31 matches), I created a chart of Grand Slam singles titles by age for several women's greats of the modern era: Serena and Venus Williams, Steffi Graf, Martina Navratilova, Chris Evert, Billie Jean King, and Margaret Court. 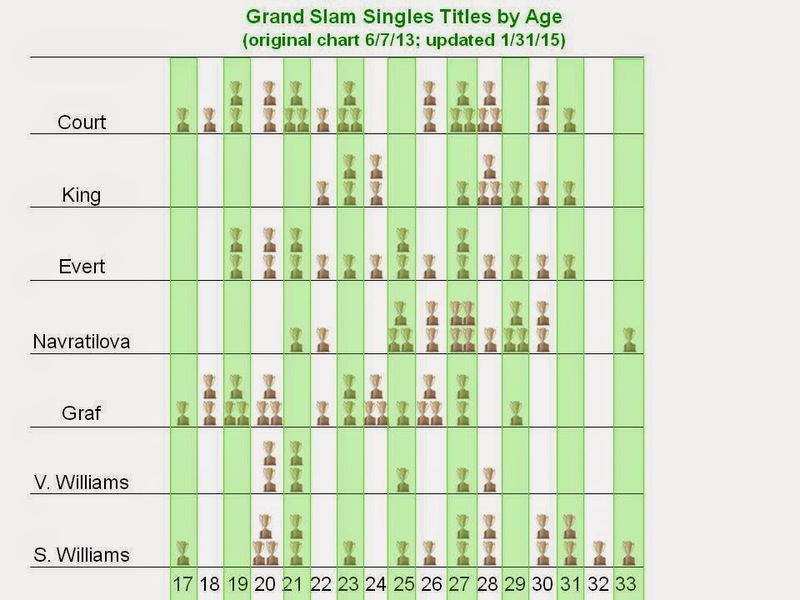 The point I wanted to illustrate was that Williams appeared to be holding her own in Grand Slam tournaments beyond the age at which other greats began falling off. Below, I have updated the chart. Williams's success in her thirties has continued, with her just-achieved Australian Open title being her third Grand Slam trophy beyond the 2013 French Open. You may click on the chart to enlarge it.